London Fashion Week was full of spirit: teen spirit, punk spirit, party spirit, the spirit of DIY culture and the vibrancy of the 1980s. 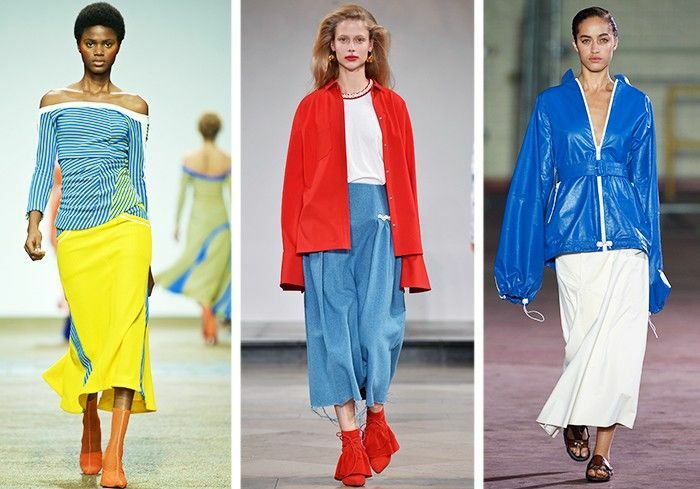 Everything felt lifted: Colours are punchy and bright, prints are bold, dresses are made for going out out, shapes are loose and free to allow you more room for moving, living, layering. 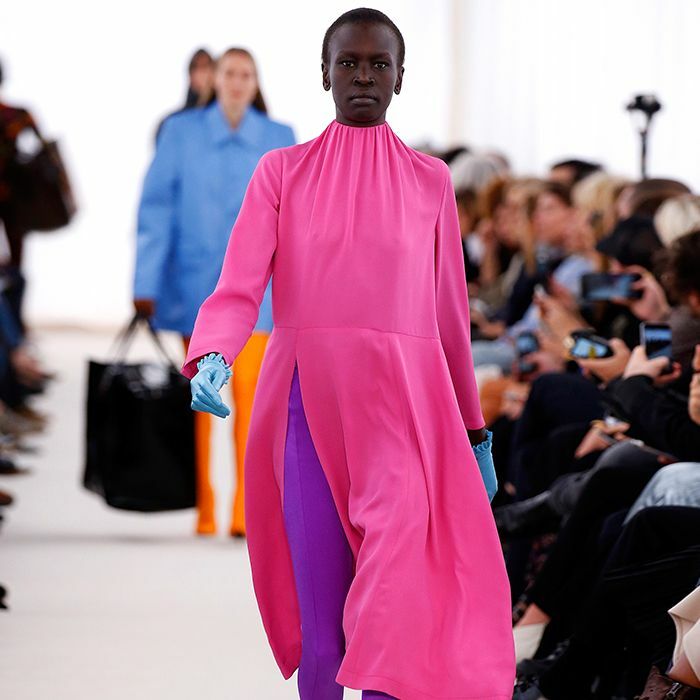 Every ensemble had been carefully constructed and then styled to provide 360-degree interest—making an eye-catching entrance or exit (as well as wearing pieces that automatically start conversations as soon as you do either) is now an important part of the fashion agenda. Almost every runway and every look came perfectly accessorised with an array of personality-building mismatched add-ons. Uniqueness—whether decidedly utilitarian and quiet, or brash and loud—is the S/S 17 trend game, and herein lie the tools to play it. Put on your sunglasses, things are about to get very vibrant out here. The past few summers have been a haven for subdued pastel tones—not this one. Spring/summer 2017 is about high-octane hues, from a resurgence in the most polarizing shade (purple, obviously!) through to primary and secondary hues that smack your senses whether used alone or paired up with their complementary partners. One particular colour—marigold, to be exact—felt the freshest and already the most popular. Rejina Pyo's marigold dress had barely been presented to the press before being worn by street stipe stars Kate Foley and then Pandora Sykes. This mellow is not yellow. Sorry, florals, the stripe is primed and in line for the summer print throne. Whimsical blooms and hot weather are about as ubiquitous a combination as any we know, but S/S 17 is all about graphic, linear surface patterns. Whether primary coloured and running along matching knitwear (Joseph), collegiate inspired and marked across all clothes and accessories within one look (Mulberry) or simply employed via classic striped shirting fabric into easy dresses (Eudon Choi), it's plain to see this will be your most cool-making option. If there is one item no outfit felt finished without at LFW, it was the earring. Now, we say earring as a singular because more often than not it was only one that made it down the runway. But that's the artsy collector's vibe—we're talking mismatched, one-only, look-closer kind of adornment. Big, statement earrings are often saved for evening-wear or when you're in a skin-baring neckline, but the rule for S/S 17 is to wear them with everything, all the time—both Roksanda and Erdem agree. Now before you think we've lost our minds and will all start dressing on a daily basis like it's the Met Gala and we are Beyoncé, hear us out. The high-fashion angle on barely there frocks doesn't hinge on looking overtly sexual or require excess flesh-flashing, it simply picks up from a growing street trend of using semi-opaque dresses as interesting layering tools over denim, shirting and, well, other dresses. No catwalk was complete without one—whether dramatic and lacy (Preen), embroidered to cover one's modesty (we spied Alexa Chung snapping away at that House of Holland look) or like a frothy tulle party piece (Molly Goddard). Check out the full spring/summer 2017 fashion trend guide here.